Home › Uncategorized › Surf’s up Saturday! Built4BBQ and the good folks at WEQX and The Hollow Bar & Kitchen are bringing you one ripper of a show this Saturday! 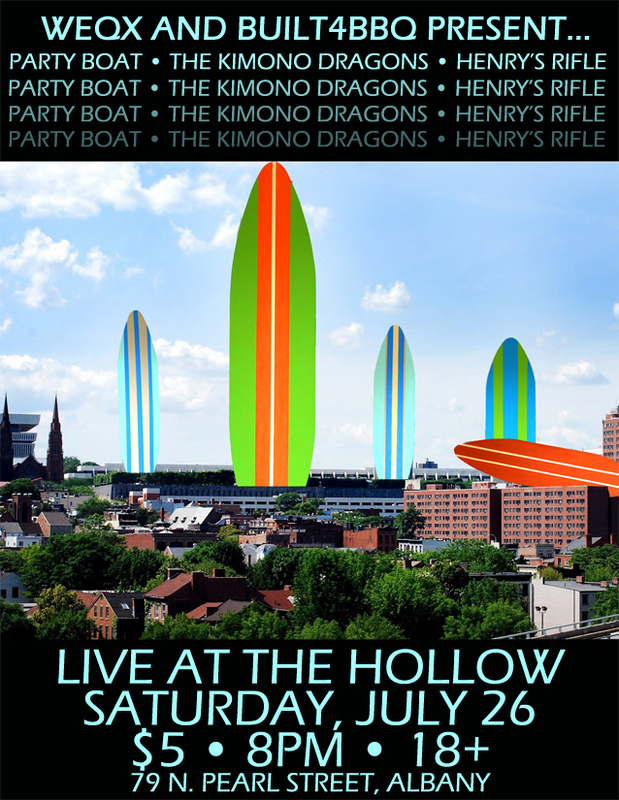 Ride a wave of surfy twang with Party Boat, The Kimono Dragons and Henry’s Rifle at downtown Albany’s finest establishment for one low, low price! You heard all three artists on the Built4BBQ Entree Comp, now catch ’em live, loud and in person. And in case you missed it, the mighty Dragons recently released their debut 3-song demo… give it a listen, we guarantee the best 10 minutes of your day. We’ll also have plenty of CD copies of the Entree out on Saturday if you were out grillin’ on the 4th! Come on out, get yourself a classy beer and a cheeseburger with a fried egg on it, and hang ten with three of the finest in all the 518!